The Poems of the Late Harry Fokinther. A few years ago an old workmate of mine now departed Charlie (Straggy) Handcock gave me a note book to read which contained the poems of Harry Fokinther a workmate from Charlie's days at Ramcroft colliery. Harry moved from Ramcroft colliery when it closed and went to work at Oxcroft colliery where he was later so tragically killed. His wife gave Charlie the poems and he would let people borrow them to read. I suggested that I could photocopy the original and do a few copys for Charlie to pass around so that the original was kept from the riggors of public reading, I also asked if I could keep a copy to which Charlie agreed. I enjoyed reading the poems so much that I tried to persuade Charlie to have them published to raise money for a suitable charity, this he declined to agree to. I think these poems should be in the public domain and respecting Charlies wishes I have produced only a few copies for other people to read. The original writing of each poem is signed with the authors signature and contains comments about some of the poems origins this has been included. The poems have been written using the original spelling and punctuation but differ slightly from the originals in so much as all words of the poems start with a capital letter and each poem starts on a new page. I have added a few notes on Ramcroft colliery at the end of the poem section for those interested. My father and uncles worked at Ramcroft colliery before its closure. (You can download a copy of the Poems in PDF format at the bottom of the page). I humbly thank my god. Ive toiled within earths crust. I scarce saw light of day. And names I won't repeat. For young men in the mine. On the wagon of N.C.B. To see these brighter days. And learn to drive a shearer. The old man portrayed in these verses actually Lived, and strangely enough showed great approval to the modern mining after a full working Life in the mines of Derbyshire he lived to be nearly ninety two. Beneath the face of this fair land. From early morn 'till eventide. To a better and brighter age. Then blasted from my rocky bed. Black and grimy though I be. Ar iso from my resourceful fold. And hew the coal beneath the land. This was composed as an appeal to all British Miners to return during the critical War Years. Your value to the nation. For relieving him of pain. And you used them to the full. Here wish you all the best. This poem was written as an appreciation to Albert Edwin Smith, known to us all as Ted. Fire officer at Ramcroft Colliery. There surely turns a wheel. To the Lads in the Telephone Exchange. Get us through to hell. And buy yourself a watch. But they say I am not with it. This human kind is worse than you. Differ only in their size. Black diamond coal, they cannot make. The Closing of Ramcroft Colliery. I bid a last farewell. The Ramcroft colliery company was formed under the guidance of Charles Paxton Markham of the Staveley company and exploited the Top Hard seam in shafts of 152 yards deep as a direct result of the war effort. After the war it was decided to construct a branch line into the colliery with sidings, two pieces of land were leased on March 25th. 1919 for an annual rent of £37:2s:6d. For a ten year period from 1929 the mine was mothballed and three men maintained the colliery.The colliery reopened for coal production as a result of the Second World War in 1939 with the Hardwick colliery company controlling it. The five hundred colliers employed could supply around a quarter of a million tons per annum from the Top Hards, High Hazels, First and Second Waterloo seams. Experiments were carried out at the colliery during the 1940's with the first hydraulic pit props, the colliery was vested into the National Coal Board in 1947. In 1935 a pipeline was constructed from the colliery to the coking ovens at Holmewood to supply it with water to quench the batteries, so a six inch diameter pipe and pumping station were installed to supply the waste Ramcroft water to the plant. Many thanks to Harry's family for correcting some discrepancies on the page, for the photograph of Harry and shedding a little light on someone I never personally met but have enjoyed his poems so much. A.N.B. The man referred to in "The Ancient Miner" was Harry's grandfather, Joseph Attenbrough. 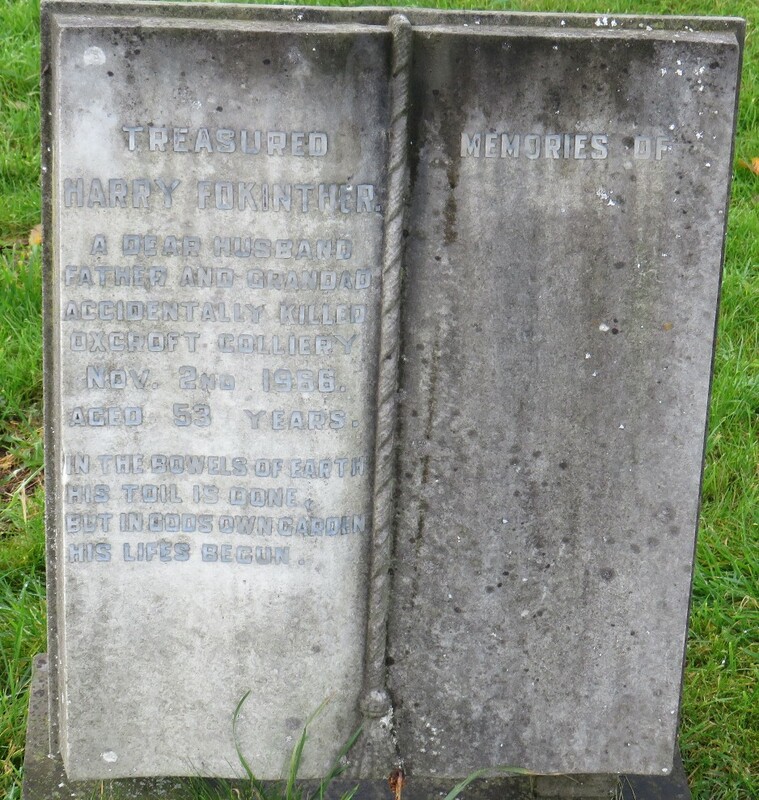 Harry left Ramcroft colliery on the Friday and started work at Oxcroft on the Monday and was accidentally killed on the Wednesday, he is buried in Scarcliffe Churchyard.